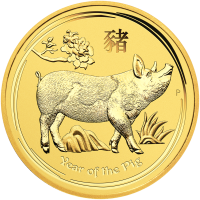 When you order your 2 oz 2019 Perth Mint Lunar Year of the Pig gold coin from our online store now, you’ll enjoy the web’s lowest rates. Closing the Lunar Series II in dazzling style, Perth Mint brings you this latest addition to their most popular series yet! The obverse design, also by Rank-Broadley, is a youthful effigy of Elizabeth II in profile, seen wearing one of her favourite jewels, the ‘Girls of Great Britain’ tiara. The country and year of origin are also visible on the obverse, along with Elizabeth II’s name and details of the coin’s face value, metal content, purity and weight. We’ll be celebrating the year of the earth pig in 2019; people born under the earth pig are known for their ability recover fast from life’s little setbacks, their understanding nature and their realistic outlook. Embrace the rich symbolism of the Chinese zodiacal system and diversify your holdings with a 2 oz 2019 Perth Mint Lunar Year of the Pig gold coin today! 앞면 Effigy of Queen Elizabeth II with the words "Elizabeth II Australia 200 Dollars 2 oz 9999 Gold 2019"
Effigy of Queen Elizabeth II with the words "Elizabeth II Australia 200 Dollars 2 oz 9999 Gold 2019"
2 oz 2019 Perth Mint Lunar Year of the Pig Gold Coin When you order your 2 oz 2019 Perth Mint Lunar Year of the Pig gold coin from our online store now, you’ll enjoy the web’s lowest rates. Closing the Lunar Series II in dazzling style, Perth Mint brings you this latest addition to their most popular series yet! The reverse design, as artfully realized by acclaimed creator Ian Rank-Broadley, features a trotting, cheerful pig, crossing under the shade of a flowering peony branch. The coin’s unique title is also to be found on the reverse, as is the Mandarin character for ‘Pig.’ The obverse design, also by Rank-Broadley, is a youthful effigy of Elizabeth II in profile, seen wearing one of her favourite jewels, the ‘Girls of Great Britain’ tiara. The country and year of origin are also visible on the obverse, along with Elizabeth II’s name and details of the coin’s face value, metal content, purity and weight. We’ll be celebrating the year of the earth pig in 2019; people born under the earth pig are known for their ability recover fast from life’s little setbacks, their understanding nature and their realistic outlook. Embrace the rich symbolism of the Chinese zodiacal system and diversify your holdings with a 2 oz 2019 Perth Mint Lunar Year of the Pig gold coin today!